The beautiful (and educational!) containers located on the centre medians in front of St. Norbert Farmers’ Market were enjoyed by both residents and visitors alike this year. My thanks to Colleen Zacharias for her informative article on these stunning floral displays! As any gardener knows, there’s much beauty to be found in edibles. Some vegetable varieties with rugged good looks or spectacular colours and textures are used to decorate beds and borders, containers, or as part of a harvest-themed centrepiece for the fall table. Exceptional symmetry, smoothness of skin, riveting colour, or even bizarre or unusual appearance, can serve as the motivation to grow and invitation to admire. The centre medians in St. Norbert, located in front of the St. Norbert Farmers’ Market, provide a fresh twist on how to grow edibles among ornamental grasses and flowering annuals for a beautiful display filled with texture and colour that doesn’t quit, especially in fall’s dipping temperatures. Lisa Fraser, corporate communications officer for the City of Winnipeg, says no fewer than 250 flowering kale have been planted along median edges and in median planters. The selected variety is Songbird Mix, a compact (20- to 30-centimetre) flowering kale series bred for form, not flavour. It has dark green outer leaves and centres of creamy white, pink and red-purple leaves. In addition, the eye-catching display includes swaying ornamental grasses such as Karl Foerster feather reed grass, Panicum virgatum switch grass, and Pennisetum setaceum Rubrum (Purple Fountain grass) together with tall, free-flowering annuals such as Verbena Buenos Aires, cannas, Prairie Sun rudbeckia, gaura (The Bride) and Double Zahara Fire zinnia for a singular display that begs to be duplicated in more public spaces. On another median, Bull’s Blood beets mingle with tropical yellow cannas, yellow zinnias, more purple verbena and the inimitable, architectural Karl Foerster grass with his golden, wheat-coloured spikes. The cabbage worm can do serious damage to the leaves of cruciferous vegetables such as cabbage, broccoli, cauliflower, Brussels sprouts, kale, kohlrabi, etc. Light, velvety green in colour, the cabbage worm feeds on the undersides of leaves. The adults are moths with off-white wings. Organic treatments typically include Bacillus thuringiensis, a common soil bacterium used as a biological pesticide and said to be harmless to birds, fish, mammals and beneficial insects. Fraser says that the city does not use chemical or biological treatments to repel the cabbage worm, hence this display of kale, viewed up close, shows evidence of chewing. Beautiful, nonetheless. 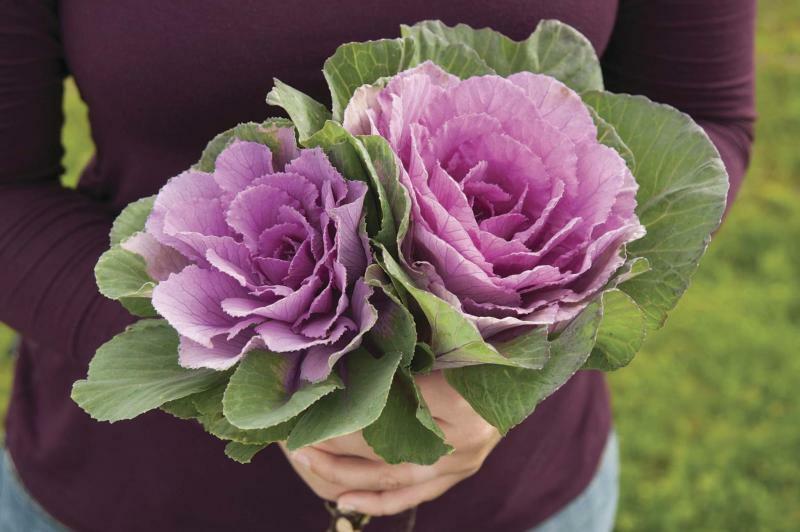 Ornamental kale varieties such as Sunset, Crane White, Crane Pink, and Crane Feather Queen Red are stunning in bouquets and centrepieces and are widely used by florists. These small-headed, leaf type cabbages grow to a height of more than 60 cm. Technically edible but not tasty, these, like all members of the cabbage family, are strictly cool season crops, achieving their best colour in fall’s cool temperatures. Seeds are generally started indoors. Days to maturity are between 90 and 110 days. Mulching to keep soil cool during warm weather is essential but so, too, is the necessity to provide support for the long stems and to remove lower foliage at regular intervals for the best aesthetics. A floating row cover is essential to deter damage by insects. These types are mainly grown by flower farmers. Justin Girard, co-owner with Britt Emory of Hearts & Roots, a two-hectare spray-free vegetable, fruit and flower farm located three kilometres south of Elie, grows a number of edibles selected both for their flavour and aesthetics. Girard, a fourth-generation farmer, sources seeds from Manitoba as well as small family-owned seed companies across North America. Hearts & Roots is only in its second year of operation. One of its main criteria is that seed is organic or untreated. Soon it will be a certified organic farm and next year, a Community Supported Agriculture farm (CSA). A huge fan of Red Russian kale, Girard says it has very tender, serrated leaves reminiscent of oak leaves. The grey-green leaves have beautiful streaks of purple that deepen in colour in cold, frosty weather. Red Russian kale is a very productive variety, he says, with an even softer, less fibrous texture than Toscano kale, a popular lacinato or dinosaur variety with heavily blistered dark green leaves. For some, the humble cabbage is preferable to kale. One option is to cover cabbage crops with netting for protection against the cabbage worm, then unveil when harvest time arrives. Danish Ballhead cabbage has uniformly light green leaves which, when folded back, reveal a perfectly cylindrical shape. Still life artists, I’m sure, would seize upon an incredibly beautiful cabbage variety known as January King, never mind a tear or two in its leaves. A French heirloom variety, this small, tightly packed blue-green cabbage (1.5 to 2.25 kilograms) with its deliciously sweet flavour is tolerant of an early fall frost and will amaze you with its shades of pink and purple. Don’t let the name confuse you, in our climate January King should be planted in spring for harvest in fall (120 or more days to maturity). Kohlrabi, another cool-season veggie, is also a member of the cabbage family. Girard says it is a fantastic fall edible that is finally gaining more appreciation. The swollen stems develop just above ground level. Girard says it is crunchy like an apple and describes its slightly sweet flavour and texture as somewhere between cabbage and broccoli. Two favourite varieties that he grows include Korridor, which is creamy white, and Azur-Star, a purple-skinned bulb with white flesh. The edible leaves, he says, are attractive and have a mustard and collard-greens flavour. Something about kohlrabi’s other-worldly looks makes it one of Girard’s favourite vegetables. He adds it to coleslaw, dips and stir-fries. Paris Market carrots proved especially popular this year at Hearts & Roots’ stall at the Downtown Winnipeg Biz’s weekly Farmers’ Market at Hydro Place and the Alleyways Market in the Exchange District. A nearly spherical French heirloom carrot that dates to the 19th century, this unique variety is only 2.5 to 5 cm in diameter. Suitable for growing in our heavy clay soils, Paris Market carrots are also ideal for container gardens. Girard is still waiting to harvest parsley root which he grew for the first time this year. A member of the carrot family, parsley root, says Girard, looks like a thin, white carrot, about 10 to 15 cm long. Its flavour is a cross between parsnip, celery and parsley. Next year Girard plans to start these seeds much sooner. As for warm season edibles, Girard’s favourite is Galeux D’Eysines, a French heirloom salmon-peach squash whose beauty lies not in its outward appearance which is covered in peanut shell-like lumps and bumps but rather in its wonderfully sweet, orange flesh. Also known as Warted Sugar Marrow (and technically a fruit), the outer warts are caused by sugar in the skin. The more protrusions, the sweeter the flesh. Girard and Emory enjoy splitting Galeux D’Eysines in half, baking it in the oven, and serving it with a bit of butter or olive oil, and salt and pepper. Galeux D’Eysines is also great in curried squash recipes or for making soup. Currently they are curing several heirloom variety winter squashes in their greenhouse. Once cured, squash can be stored in a cold room for up to six months. PHOTO: Johnny’s Selected Seeds. Grown more for its form than its flavour, Sunset Ornamental kale is beautiful in outdoor displays and in bouquets.